I'm caught between calling it 'Awesome!' and saying that there was still something left to be desired about The Caller. But ultimately, I enjoyed the heck out of this last book in the Shadowfell trilogy and loved the hell out of both Neryn and Flint and even the minor and not-so-minor supporting characters. There were only a few things in the broken world of Shadowfell's kingdom that had me questioning logic... but then I would turn around and find a way to justify what I had thought didn't make any sense. Just as well, since there were also a few things about the story's progression that felt predictable as well, but that I said "whatevs" to and continued to read and enjoy the book without analyzing it. And so in the long run, I just ended up deciding to throw my objectivity out the window and just give the book a completely biased rating based solely on how much I loved the book, the conclusion, and the series in general, the world, the culture, the back-history... pretty much everything about this book was pretty damn awesome! On a side note, I noticed that my rating kept climbing higher and higher with each book. Keep in mind that this has more to do with my influenced enjoyability as I got to know the characters, the setting, the world, the Good Folk and their ways, and Neryn and Flint and Tali et al, as the story progressed. Sometimes when you become invested in a world and its characters, it's hard NOT to finally fall completely in love with them. Because the endless traveling and long-drawn out days of Neryn waiting and waiting and waiting were an ongoing theme in all three books; however, while they felt uneventful and monotonous and long-winded in Shadowfell, they started giving me a sense of excitement as the last two books progressed. It's strange how much leeway you're willing to give certain similar writing styles and repetitive themes and predictable story progression if you just so happen to be steadfastly in love with a book. Yea. It's a thing. The conclusive war against the oppressive King Keldec and his psychotic queen and manipulative councilors is finally drawing near as the seasons change. The Midsummer Gathering is right around the corner and Neryn must continue on with her training in spite of the tragedies and concerns flowing over from where we last left off in Raven Flight. Because Tali has been seen in public at the Midwinter Gathering, she can no longer accompany Neryn to seek out the last two Guardians--just as well, Tali is needed at Shadowfell to finalize the rebellion's last plans in the place of Regan who has lost his life on a technicality mission gone wrong. Now traveling with Neryn is Whisper, an owl-like Good Folk who is able to transport her from one place to another, saving precious travel time in order to finish her training before the Midsummer Gathering. Along the way she meets new allies and friends who prove just as significant in the ending outcome of the rebellion. But more obstacles surface as Neryn learns of the frail state the Good Folk of the East are in, then following is shown a gruesome parade of Good Folk by the King's Enforcers, that can only mean that Keldec has found Caller for his own twisted greed and use. The tides of the rebellion may have changed now unless Neryn can find a way to turn everything back around. I like that each book of Shadowfell has ongoing twists and turns and secret surprises as the story progresses. And I like that with each new obstacle, Neryn only becomes stronger, more determined, as well as much more steadfast in her belief of the rebels' cause. Despite not being the warrior woman that Tali is, whom I missed in this book, by the way, Neryn has her own brand of strength and resourcefulness and tact. It's slightly inconceivable that one young girl was able to do all that she did in The Caller and make such a big influencing change among the human folk and the uncanny Good Folk just by being present, but I'll live with it. It gave rise to some interesting story progression, that's for sure; and it took the story in the direction it needed to go. The endgame was a little too neatly packaged, to be honest, but as a big fan of Happily Ever Afters and satisfying endings, I'm not complaining. The Caller also became very 'Flint'-significant, more so than the first two books had been. I've always been very 'meh' about books written in 1st person POV, but I accept them as they are anyway. When a book starts taking on multiple POVs, alternating between 1st and 3rd, though, I get a little wary. Fortunately, the transitions were smooth enough that it didn't bother me, and at the same time we get an insight into Flint's mind and his actions, which was not bad at all. Did I mention that Flint still comes off as kind of swoon-worthy despite his continued plunge into misery? Well, he kind of is. And even though the romance in the Shadowfell series is fairly backseat, there's still enough mention of it here and there to continue solidifying just how strong the bond between Neryn and Flint has become after all this time. It's nice to see a developing romance that didn't start from instalove, that doesn't become a handicap for our characters, that doesn't end up the main priority of the couple's lives, but still managed to feel significant, strong, and exude warm and fuzzy feelings whenever the two of them were allowed their rare moments alone together. 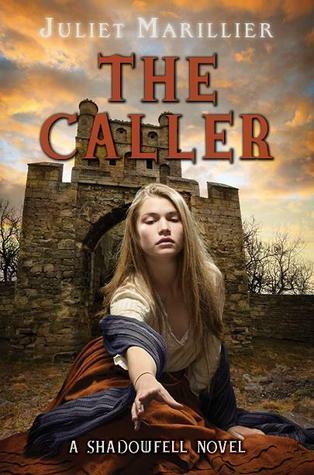 The Caller was definitely full of significant progression, with a new turn of events each time we think a chapter in Neryn's adventure has come to pass. There is little time to dwell on past events as a new one unfolds almost immediately with our characters constantly moving forward until the final stages of the rebellion come to light. The conclusion to this book as well as the series is well-rounded and satisfying, but purposefully leaves an open-ended "there are still many things to do for the future of Alban" out there. However, in the end, it IS a final ending and I doubt much more will be said about Neryn or Flint or Alban. The world of Alban and it's histories are rich and extensive, but not overwhelming. The characters were created and developed excellently, each with their own personal stories, each with their own purpose even if it's not evident in the present setting. Juliet Marillier definitely created a wonderful world in Shadowfell, the type that I wouldn't mind revisiting again and again, as even the minor characters seem to have untold stories that could become an adventure of their own. Her writing is smooth, beautiful, descriptive, almost magical... what more is there to ask for? There are... parallels that stood out for me. And maybe I'm just looking too hard or seeing things where they really aren't. But the beginning of the series--the constant traveling with not much really happening--was reminiscent of The Hobbit, wherein I recall telling people that the first 50% of the book is traveling and walking and world and story build-up. That's fine. That's how most high fantasy adventures are anyway. But then there was the ending which also reminded me, once again, of Tolkien and it made me... well, I didn't how what to think about it. How Neryn and Flint are boarding a boat and everyone of their friends are standing around, bidding them farewell. I mean, it's not like it's an exact replica of the ending from Lord of the Rings movie where Frodo leaves on a boat... but it's there. Maybe it's just me. Not that it influenced how much I enjoyed the series though, so it's a moot point.